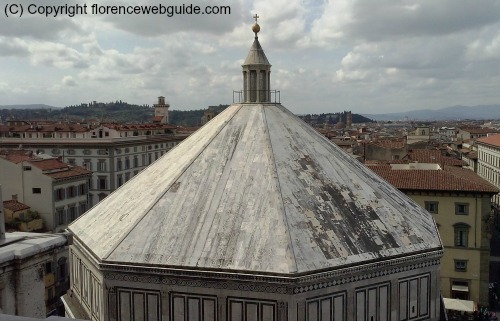 The Florence baptistery is one of the oldest religious monuments in the city. Named after the patron saint of Florence, Saint John the Baptist, the building is called 'il Battistero di San Giovanni'. 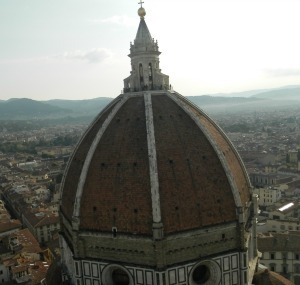 The baptistery is located right in front of the Duomo, the Florence cathedral Santa Maria del Fiore, which for centuries was the religious and civic heart of the city. Built in a Romanesque style with white marble from Carrara and green marble from the nearby city of Prato, the building is topped by a pyramid shaped dome with 8 triangular sides. Undoubtedly, the baptistery is most famous for its 3 sets of bronze doors, including Ghiberti's masterpiece, 'the Gates of Paradise'. These works of bronze sculpting are often cited as the official 'start' of the renaissance in Florence. 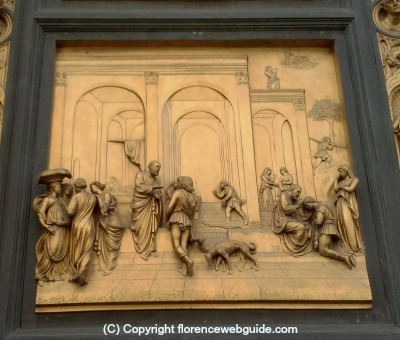 Read all about the Florence baptistery and see detailed images of its famous art work below. 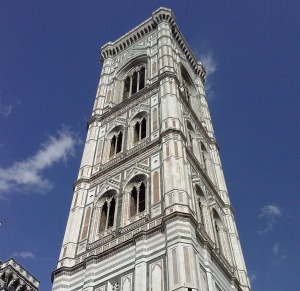 The history of the Florence baptistery is a bit sketchy. The site of the building is said to have been an ancient Roman temple dedicated to the god of Mars going back to the 1st century AD. In the early 5th century, a Christian church was then built on the site and enlarged over the centuries. We do know that the building was first mentioned in writing in the year 897 when it was referred to as a 'basilica', which means that in its early life the baptistery was used as a church and not just for christening. In spite of this vague history, we do know that the baptistery was officially consacrated in 1059 by Pope Nicholas II. In 1128, the building became officially a 'baptistery' and no longer a cathedral, and it is from this period that it began to take on its current decoration of external marble and internal mosaics. 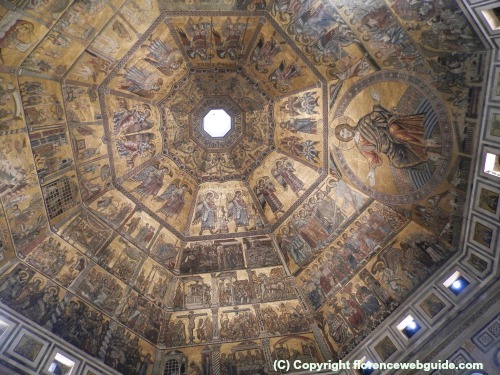 The baptistery's octagonal shape is deemed to go back to one of the earliest phases of its construction. 8-sided baptisteries used to be common, as the number eight has symbolic meaning in the Catholic church. Eight is the number associated with regeneration: after 6 days of creation, the 7th day is for rest and the 8th day is for re-birth through the rite of baptism. 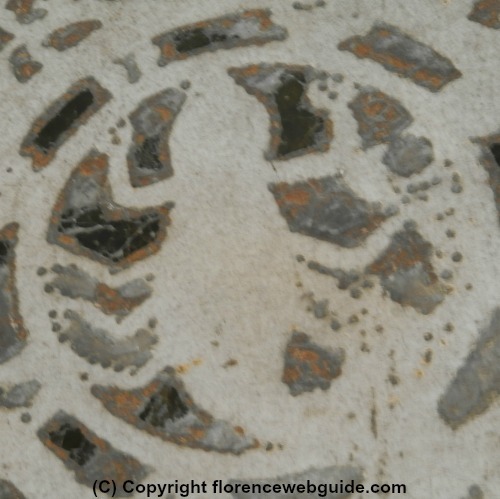 The Florence baptistery has a couple of curious details that you may like to take note of when you visit. During Roman times, we know that a cemetery was located near the building. Notice the picture below of the ancient sarcophagus which has been built into the exterior of the wall. Positioned to the left of Pisano's bronze doors, it's interesting to note how this pagan sarcophagus was built into a religious institution. 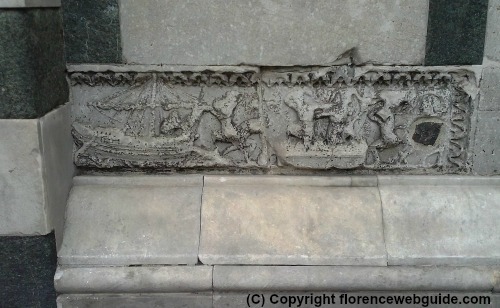 The relief images on the coffin depict the picking of grapes and the transport of wine on boats. It is likely that the sarcophagus was used for burying a wine merchant, and it may have been chosen for the baptistery due to the church's use of wine to represent the blood of Christ. The inclusion of this ancient relic in the building of the baptistery is a way to remember the history of the site and the Roman origins of Florence as well. 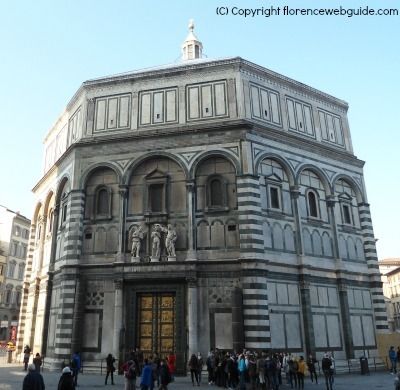 The Florence baptistery has a rectangular part jutting out of one of its sides which corresponds to the altar on the inside. Just above this square section, at the corners, are sculptures of a lion (the head) with the head of a person in its paws. This is an early version of the Florentine Marzocco, the lion symbol of the city. Donatello sculpted the most famous verson of the Marzocco lion in the 1400's, which is the image that most people are familiar with. 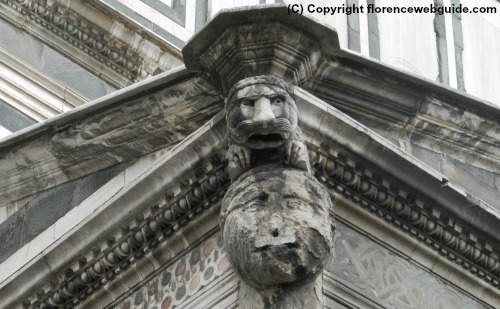 It's interesting to see how the lion was perceived 200 years earlier, already as a symbol of Firenze. 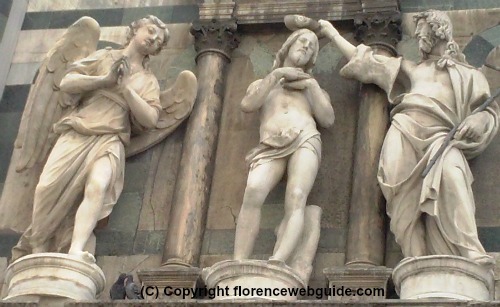 Above the 'Gates of Paradise' (the entrance directly in front of the Duomo) is a sculpture of John the Baptist christening Jesus as an angel looks on. This is a copy of the original work dated 1502 by Andrea Sansovino. 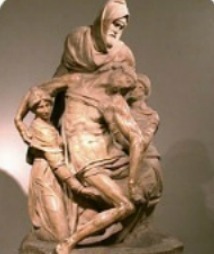 The original is kept at the Opera del Duomo Museum. As said earlier, the Florence baptistery is known for its bronze doors and the art work represented on each of the three sets of panels. The doors were commissioned by the 'Arte della Calimala' (the Cloth Guild), overseers of the baptistery. Carried out between the years 1330 and 1452, the doors are made up of square panels each recounting an episode from the bible. It's important to remember that art commissioned by religious institutions in the 14th and 15th centuries often served to 'teach' people. Most citizens were illiterate and could only 'read' the bible through images. 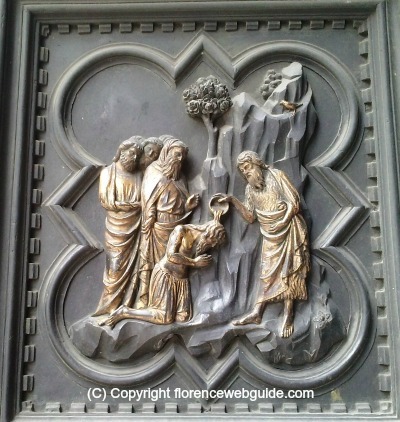 The first doors were made by Andrea Pisano and illustrate the life of John the Baptist. The second and third doors (the 'Gates of Paradise') are the work of Lorenzo Ghiberti and depict the life of Jesus and episodes from the old testament. The baptistery's first set of doors were made between 1330 -1336 by Andrea Pisano, a former pupil of Giotto. 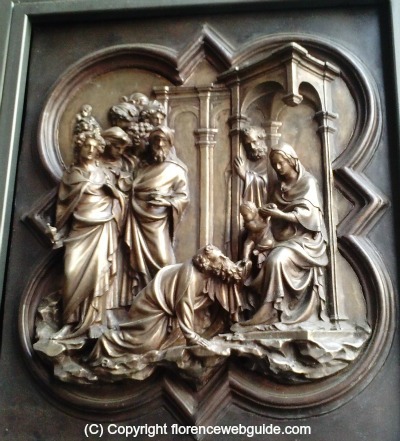 The door is made up of 28 square quatrefoil panels, each illustrating a scene with relief images sculpted in bronze. The first 20 panels, from the top down, recount episodes from the life of John the Baptist. The eight panels at the bottom represent the virtues: hope, faith, charity, humility, fortitude, temperance, justice and prudence. 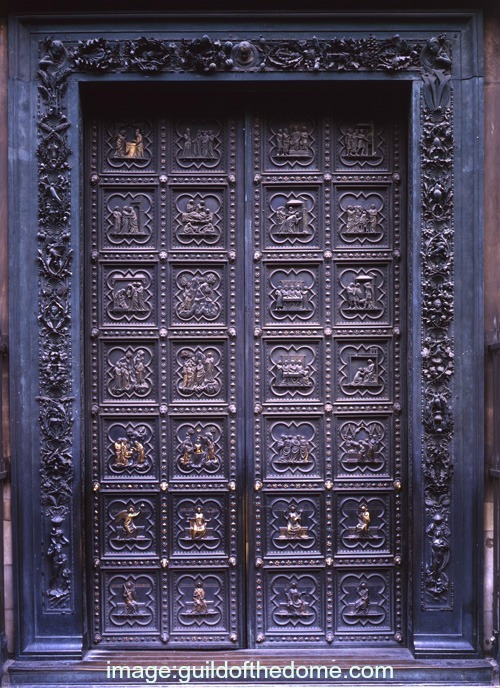 Originally Pisano's doors were placed in the main entrance to the baptistery, directly in front of the Duomo, but were later moved to make way for Ghiberti's creation. 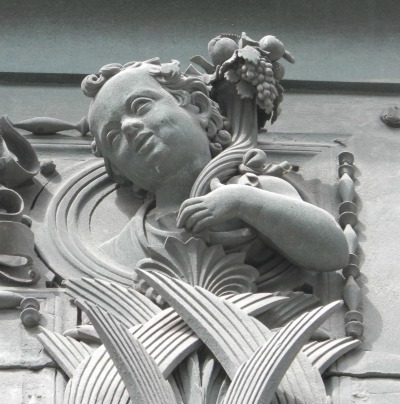 Today they can be seen on the south side of the building, to the left of the 'Gates of Paradise'. Below see examples of panels with relief sculptures in the Gothic quatrefoil shape. On the left John the Baptist christening Jesus, on the right the disciples being baptised. Below two panels depicting the virtues Charity (left) and Humanity (right). The frame surrounding the Pisano doors is a work of art in its own right. 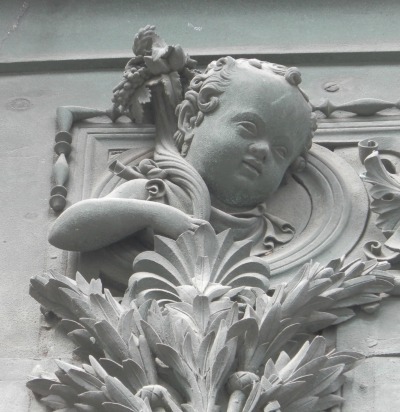 At the top left and top right corners you can see these two cherubic infants surrounded by fruits and foliage, symbolic of the baptism of children and the wealth of the life ahead. Pisano's doors were considered a great success, but the baptistery had 3 main entrances, so in 1401 the overseers of the Florence baptistery decided to have another set of bronze doors made. A competition was held to find a suitable artist which asked the applicants to produce a bronze panel depicting the 'sacrifice of Isaac'. 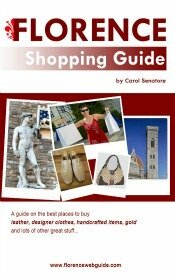 Many of the biggest names in Florence at the time competed against each other, including Donatello, but the Cloth Guild decided on two finalists, Ghiberti and Brunelleschi. In the end Ghiberti was awarded the commission. Interestingly, some history books say that Ghiberti was chosen because his panel used less bronze which made it lighter, and therefore cheaper to produce. Cost was likely an aspect that the pragmatic baptistery committee would certainly take into consideration, so perhaps there is some truth to this theory! 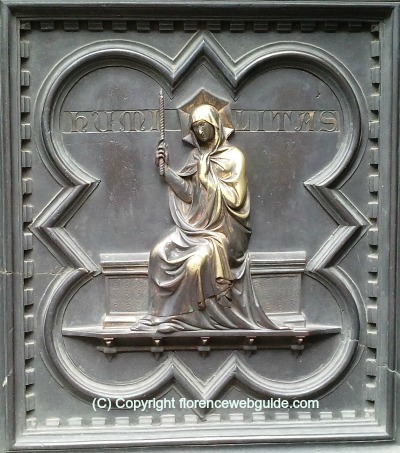 However, Brunelleschi's panel was considered every bit as masterful as Ghiberti's. All the other panels admitted for the competition ended up being melted down and the metal re-used, whereas Brunelleschi's panel was sent back to him intact, too beautiful to be destroyed. These two original bronze panels of Abraham about to slay his son Isaac by Ghiberti and Brunelleschi can be seen today at the Bargello Museum. This second set of doors follow a similar structure to Pisano's doors: 28 bronze quatrefoil panels depicting episodes from the bible. Ghiberti's doors recount the life of Christ with events from the New Testament in 20 panels and 8 panels at the bottom dedicated to evangelists and fathers of the church. 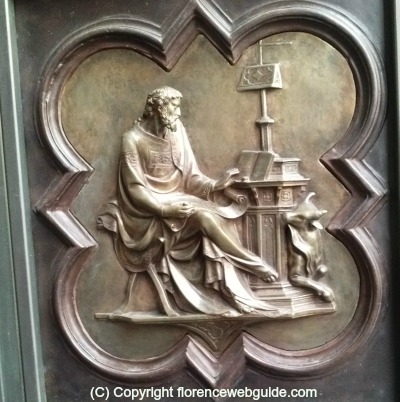 These doors to the Florence baptistery (which you pass through to enter the building) took Ghiberti 21 years to make. 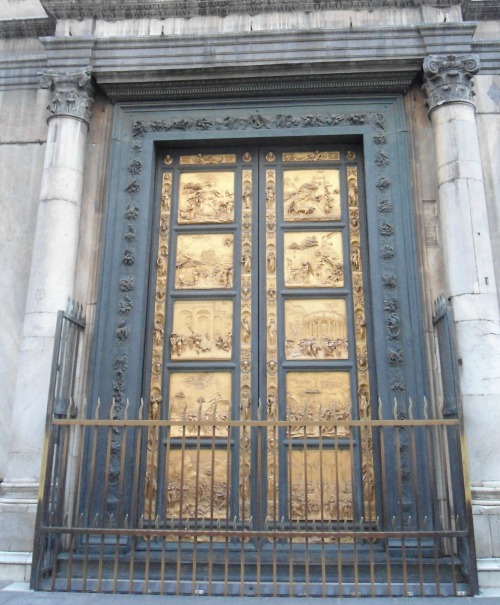 So admired was the finished product that when the Cloth Guild decided to have a third set of doors commissioned no competition was held, and the job was immediately given to Ghiberti who would go on to create the famous 'Gates of Paradise'. 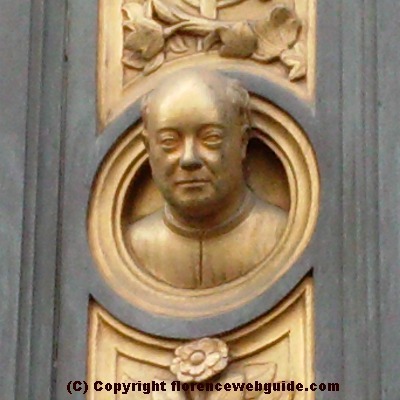 It's said that it was Michelangelo who gave Ghiberti's second set of doors their name, 'the Gates of Paradise'. Supposedly, upon seeing the finished work, Michelangelo exclaimed, 'these doors are so spectacular they could be the gates of paradise!'. Whether this is true or not we'll likely never know. But one thing can be said for sure about Ghiberti's masterpiece: the 'Gates of Paradise' are considered the first major work of the Florentine renaissance. 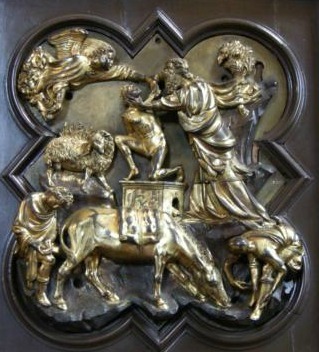 Made between 1425 and 1452 - a 27 year project - the doors tell the story of the Old Testament. To carry out his vision for the Florence baptistery Ghiberti set up a workshop of master sculptors and bronzesmiths, including renaissance greats the likes of Donatello, Michelozzo, and Paolo Uccello. 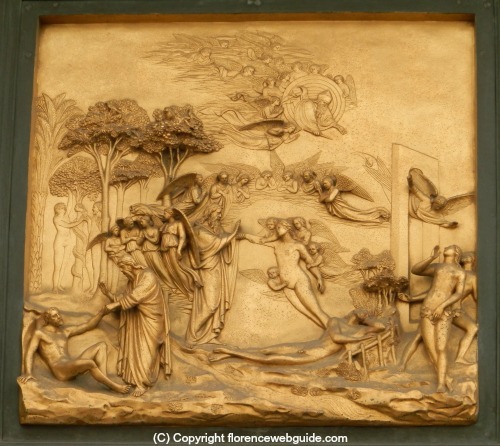 In the 'Gates of Paradise' Ghiberti made a major change from the previous 2 sets of bronze doors: he recounted his story in only 10 panels, rather than 28, telling more than one episode in each panel. Ghiberti was able to do this by giving depth and 3 dimensions to the reliefs so that each episode within the same panel could be set apart and distinguished from the others. 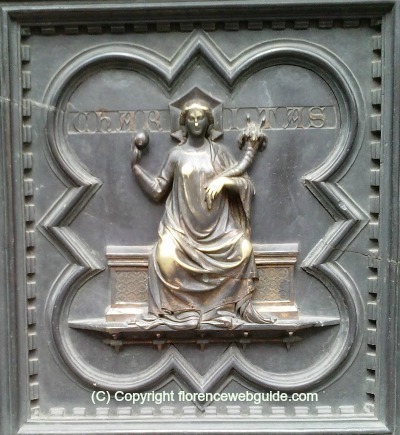 This is just one of the signs that mark Ghiberti's work as early renaissance. 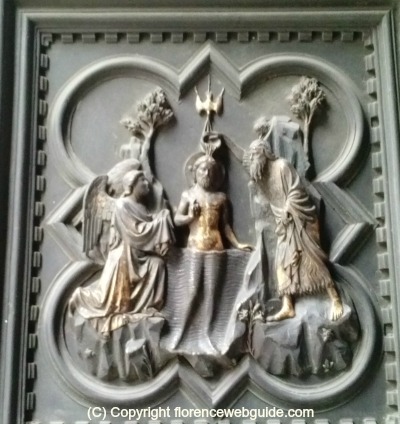 As we saw, the first two sets of bronze doors have images in Gothic quatrefoil shapes. Ghiberti broke away from that and placed his sculptures in an open space with greater perspective, creating a foreground, background and distances in between. For example, 'Adam and Eve' (above) shows three stories: the creation of Adam and Eve, original sin and expulsion from paradise. Similarly, the panel about 'David' not only tells of the boy's battle and triumph but also his victorious celebration afterwards. 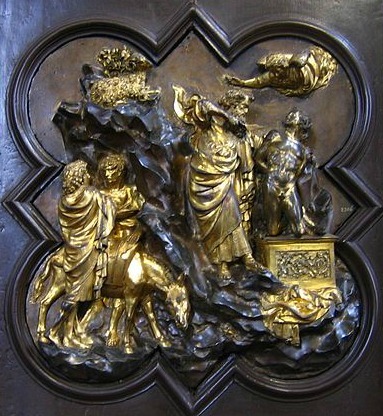 The sculptures of 'Jacob and Esau' is a good example to point out the renaissance features of Ghiberti's work (below). Note the classical Roman columns in the background and the floor tiles in the foreground which bring the viewers eyes in towards the main image. This use of perspective is one of the most distinguishing traits of renaissance art. The frame around the doors are equally elaborate filled with figures and small busts of prophets, sibyls and biblical figures. Among these however is a self-portrait of Ghiberti, practically (and conveniently!) placed at eye level. You should have no trouble spotting this small bust of a bald man with a very serene look on his face. Ghiberti died a few years after his famous doors were installed, having said that he considered this work for the Florence baptistery his life's greatest achievement. 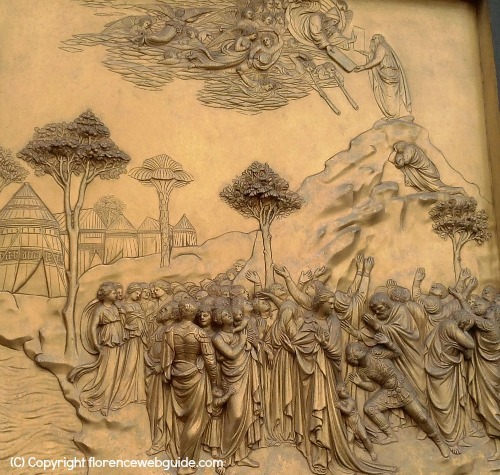 Ever since they were unveiled in 1452 Ghiberti's doors have been seen as masterpieces to be fiercely protected. They got their first 'cleaning' as early as 1475, during WWII they were removed and hidden for safe keeping and, after the flood of 1966 which caused damage to the lower panels, they were removed and replaced by reproductions. Anyone coming to Florence today is fortunate because the original 'Gates of Paradise' are back on display at the Florence Cathedral Museum after a 27 year restoration process. The decoration inside the baptistery is inspired by Roman buildings such as the Pantheon. 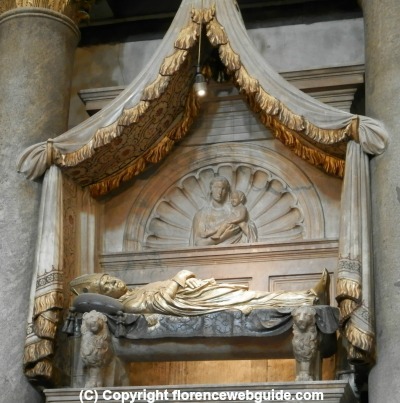 There are Byzantine mosaics, Roman sarcophagi, and Romanesque arched windows, as well as funeral monuments to a member of the Medici family and an Antipope from the 1400's. 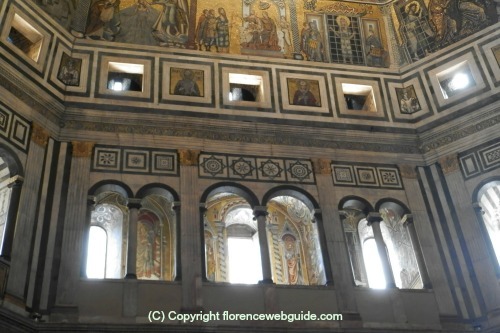 The inside of the Florence baptistery is most known for its Byzantine style mosaic ceiling. This mosaic work goes back to the 1200's and is a very detailed account of 'Universal judgement' having several layers of symbolism which took over 100 years to complete. The dome ceiling is decorated in 5 ring-like sections, each dedicated to different images. On one side of the 'Universal Judgement' mosaic you can see a very large image of Jesus. On the left of Christ are images of 'Salvation', on the right, 'Damnation'. This latter section is particularly disturbing and (perhaps for this reason) the most well-known part of this Florence baptistery mosaic. 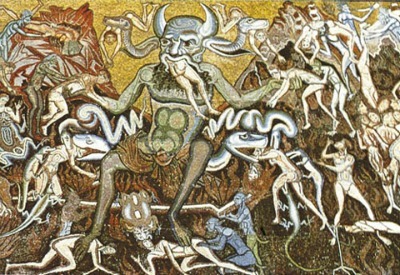 In contrast to the images meant to comfort 'good' citizens in 'Salvation', this side illustrates what awaits any 'evil doers' with frightening detail showing the terrors of hell. 'Intarso' is a type of inlaid marble work where different colored pieces of stone are joined together so closely that the finished product seems like one singular piece. Intarso can be done to form images or simply geometric or floral patterns. 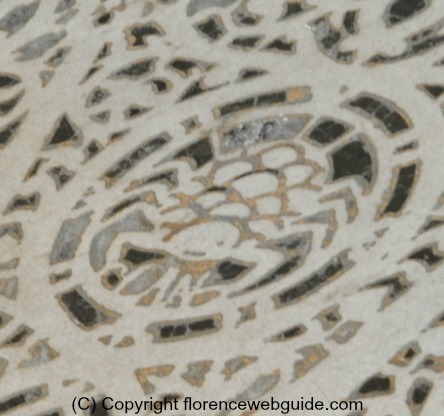 The Intarso floor of the Florence Baptistery has a combination of both, with one particular feature. In the 11th century the floor used to have a sun dial, with astrological symbols serving as time indicators. Although the hole in the ceiling allowing for the ray of sun to hit the floor has since been closed up, the zodiac marble images can still be seen to the left when you enter. 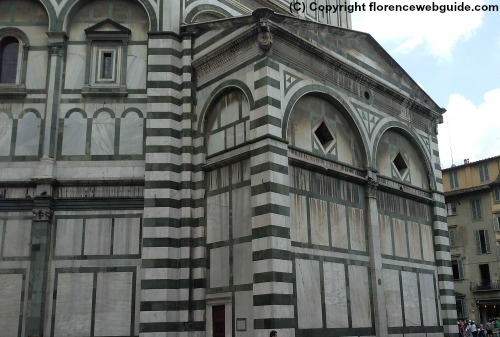 A few select individuals were considered special enough to be buried in the Florence baptistery. The first was Guccio de Medici, one of the first of the dynastic family to serve the city's government in the early 1300's. Upon his death, this Medici was buried in a Roman sarcophagus, the sides of which illustrate scenes of boar hunting, a popular Tuscan pastime. 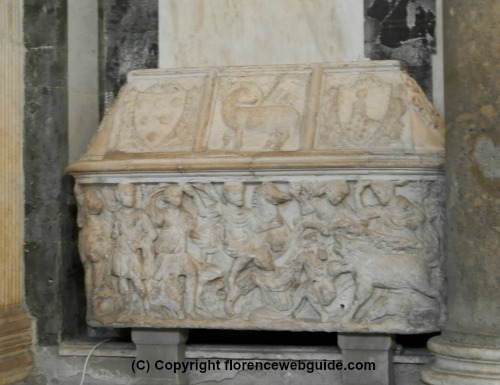 Notice the Medici shield with the famous balls on the left of the coffin covering. Here we find a fascinating bit of Florence history. 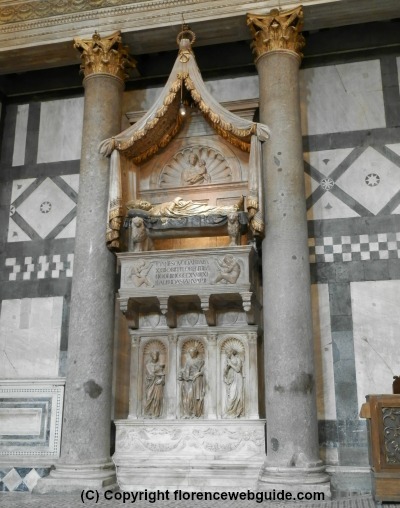 The tomb of anti-pope Giovanni XXIII, born Baldassari Cossa, can be found in the Florence baptistery. Cossa died in Florence in 1419, and although he was known as a wretched individual, he was a friend of the Medici family, who had him buried in this holy building. It was thanks to Cossa that the Medici managed to become so wealthy. Upon becoming Pope, Cossa - out of loyalty to Giovanni de Medici who had helped him on many occassions - took on the Medici bank to manage the Vatican's finances. A true stroke of luck that played a huge part in forging the Medici fortune! 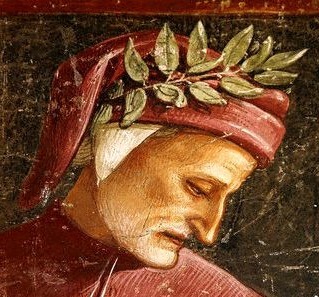 Although he was stripped of his Popehood, Cossa wanted to be buried in the Florence baptistery. Cosimo de Medici commissioned this funeral monument from Donatello and Michelozzo between 1422 - 1428 for his notorious friend. This 'canopy bed' style was the first funeral monument to use this type of imagery for a tomb and shows the creative invention of the two master artists. Also, the face of the anti-pope (cast from the death mask of Cossa) is turned towards the on-looker, rather than looking up towards the sky as was customary at the time - another innovative feature added by Donatello and Michelozzo. What Famous People Have Been Baptised here? Not just a historic and religious symbol, the baptistery is also a place used for christenings of course. 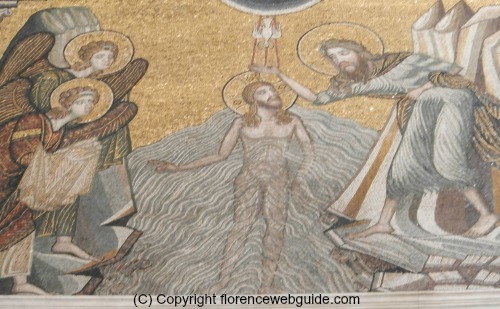 Throughout history several well known Florentines and Tuscans have been baptised at the Florence Baptistery. Probably the most famous person to have been baptised here is poet Dante Alighieri (1266), who refers to the building as 'my beautiful San Giovanni' in his 'Divine Comedy'. Other noteworthy individuals include: explorer Amerigo Vespucci (1454), Niccolo Machiavelli (1469), Lisa Gherardini - the face of Leonardo's portrait the 'Mona Lisa' - (1479), and grand duke Cosimo I de Medici (1519). More contemporary names include inventor Antonio Meucci (1808) and Carlo Lorenzini, aka Collodi, author of Pinocchio (1826). 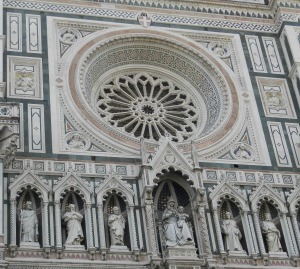 Read more about the Duomo Complex! If you like the content of this page, please share! Click the button below. Great News....Photo taking is now allowed in Florence Museums! Copyright © 2015 florencewebguide.com By Carol Senatore All rights reserved.